Pope Francis's climate-change encyclical, “Laudato Si' ” offers a picture of the choice now confronting every government, corporation, and person on the planet in Trump's post-Paris Agreement world. At the Vatican, the Pope gave the President a copy of his encyclical on climate change, a blistering indictment of the human failure to care for Earth, now more poignant than ever. When the President met the Pope at the Vatican, last week, it was as if they were members of different species, so far apart in values and style that the actual content of what separated them proved elusive. Francis slyly presented Trump with a gift, though, that— as of yesterday —defines their opposition as absolute. 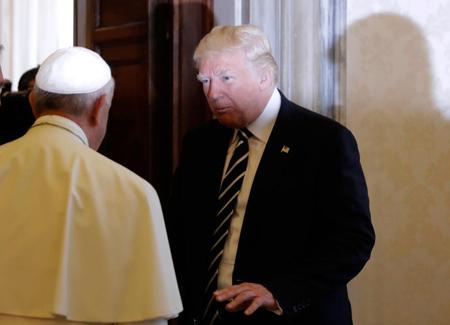 The gift was a copy of his encyclical on climate change, “ Laudato Si' .” Trump politely promised to read it. Sure. In withdrawing from the Paris climate accord , the President demolished everything that the 2015 papal declaration represents. On this, the day after Trump's decision, “Laudato Si' ” is more important than ever. A blistering indictment of the human failure to care for Earth, it is also a poignant description of the momentous choice now confronting every government, corporation, and person on the planet. Trump may not have read it, but everyone who seeks to understand in explicit terms the depth of the danger he represents should. “Laudato Si' ” is a manifesto. If you read it two years ago, read it again now. But the dangerously degraded planet, for Francis, is a manifestation of a deeper problem, for “we cannot presume to heal our relationship with nature and the environment without healing all fundamental human relationships.” Though the Pope would not say so, Trump is an embodiment of the moral pollution that generates atmospheric pollution, a sign that something has gone gravely wrong in the way we humans relate to one another. Trump, the compulsive tweeter, is a product and exploiter of the digital overload that generates, in Francis's words, “a new type of contrived emotion which has more to do with devices and displays than with other people and with nature,” that leaves us blocked from “direct contact with the pain, fears, and the joys of others.” The disorder is widespread; when the President divides the world between winners and losers, many people agree with him. The Paris accord, which upholds the ideal of human solidarity, rejected this paradigm, which, ultimately, is why its maestro rejected Paris. But the zero-sum mode of organizing life—personally and internationally—brings nothing except death, and the planet is telling us so. For Francis, as a religious man, the love of one's neighbor is the surest sign of God's presence. But his invitation is profoundly secular, for his critique of the shrunken circles of love that reduce family, tribe, and nation to shelters from the larger human commonwealth has everything to do with this world, not the next. This world's value is absolute. If the rescue of our one and only heaven requires economic, psychological, political, and spiritual revolutions—or, rather, one revolution combining all of those—then let's be about it. That is the message of this encyclical, the gift. What Trump offers to the nation and the world is only fear. Even those who grasp the urgency of the climate crisis may be tempted to see it as an already lost cause, a deadly eradicator of hope. They might, even in spite of themselves, join Trump in his blatant quitting. But, for Francis, resignation before the obliteration of hope is itself deadly. While the Pope, in “Laudato Si',” argues that we must accept human responsibility for what threatens human survival, he still insists that we “are also capable of rising above ourselves, choosing again what is good, and making a new start.” Faced with a threatened environment, we can do that. Faced with a foolish nihilist for President, we can do that. James Carroll is the author of eleven novels and eight works of nonfiction, including, most recently, “Christ Actually: Reimagining Faith in the Modern Age.” His new novel, “The Cloister,” will be published next year by Nan A. Talese/Doubleday. . Petroleumworld does not necessarily share these views. Editor's Note: This commentary was originally published by The New Yorkeron June 2, 2017. Petroleumworld reprint this article in the interest of our readers. Link to original article.